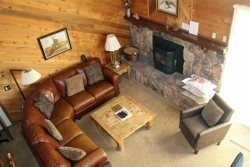 4/29: Mammoth Lakes Rental Sunrise 15 - Living Room has a Woodstove- Firewood is not provided in unit 15 - guests will need to purchase their own firewood. One Bedroom & Loft & Two Bath Condominium in the Scenic Meadow Area of Mammoth Lakes. Sleeps up to 6 (approx. 1100 Sq. Ft). This spacious 2 story unit has vaulted ceilings and you walk up one flight of outside stairs to enter the unit. Corner unit is bright with lots of windows to let the light in and has a nice view. The first floor is the Master Bedroom, Kitchen, Dining Room, Living Room and 1 Full Bathroom. The second floor is the Loft and the 2nd Full Bathroom. The Loft is open to the living room by a half wall. The Master Bedroom has 1 Queen Bed and 1 Twin Roll-a-way Bed, the Loft has 1 Queen Bed and 1 set of Bunk Beds, and there is a Queen foldout couch in the Living Room. There is a 32` Flat Screen TV in the Living Room and a TV in the Bedroom. There is a VCR and a /CD player. Wifi Internet Access in the unit.Fireplace but wood is not provided - guest will need to purchase their own wood. There are two outside parking spaces available. Sunrise Condominiums offers a Spa, Seasonal Swimming Pool and Sauna. Coin-operated laundry facilities located in the common area near the office. COMPLIMENTARY INTERNET and CABLE TV are provided, however NO REFUNDS will be given for connectivity problems or Internet failure TOT LICENSE 807-SR15. There is a Fireplace but wood is not provided - guest will need to purchase their own wood. Fireplace but wood is not provided - guest will need to purchase their own wood. Great value for money, nice architecture with a lot of windows. Condo has wooden fireplace and two full bathrooms. Furniture dated but good value. you guys will love this place! been here twice! Thank you for the quick turnaround and for the hospitality. The vaulted ceilings really make the space feel big and comfortable. Great setup to cook group meals in the kitchen and hangout in the living room after a long day of skiing! A short walk to the bus stop, then about a 15 min drive to the mountain. Not bad at all. This was a great spot to stay at while snowboarding @ mammoth ski resort. It was a quick, down the street type of location. Close to vons and gas stations. Would recommend, and definitely stay here again if available! We enjoyed staying in SR 15 for the month of July. The location was really great with walking distance to town and the bike trail and park so close.